French PDQ (Pretty Darn Quick) is fun and easy-to-use. This course is versatile - no need to be glued to a computer or textbook. You can use the 4 audio CDs in your car, MP3 player, or any other CD player, they are a perfect on-the-go alternative to acquiring a new language. Lessons are bilingual, which means that it is possible to complete a PDQ course by simply listening to the recordings. You can learn in your car and then reinforce your knowledge with the workbook/learning guide. The course focuses on developing everyday essential French phrases using native speakers. 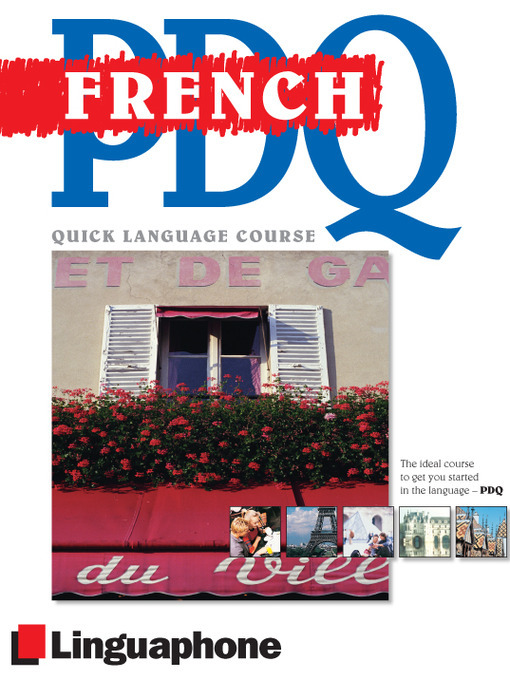 Ideal for beginners to the French language, the popular PDQ course will have you speaking, writing and understanding basic French in no time! PDQ will help you develop the correct pronunciation with an authentic accent. You will acquire: over 500 practical French words and phrases; the ability to speak, understand and write basic French. This course is great for students, travelers and business people. Native speakers take the listener to France, where you will discover how to get by in a wide variety of everyday situations. Sample topics covered are: meeting and greeting people for the first time; asking questions and ordering food and drink; talking about your family and friends; finding your way around and asking directions. You'll learn French quickly with the audio instruction and course book packed full of exercises and tests. With the PDQ course, you aren't just taught words and phrases - you're coached on how to actually converse using your new language. Course includes: Four hours of digitally recorded audio instruction and a full-color downloadable (PDF) workbook/learning guide.